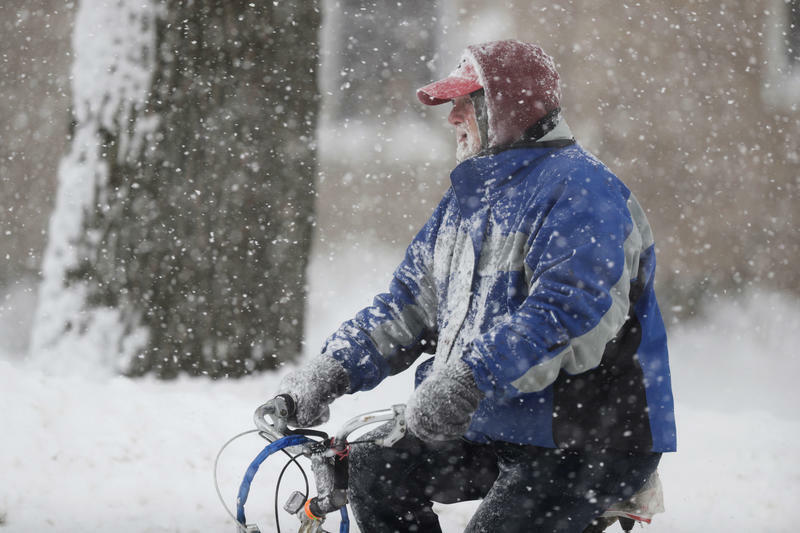 A man rides on his bicycle as fresh snow falls, Friday, Dec. 29, 2017, in Erie, Pa.
Maine health officials are warning of the dangers of the deep freeze that's hit the region, with temperatures across the state Thursday night plunging well below zero into record-breaking territory. Hypothermia and frostbite are the biggest concerns, officials with the Maine Center for Disease Control and Prevention say. Hypothermia, caused by low body temperature, can be fatal. Freezing or nearly freezing parts of the body can cause frostbite, which typically affects fingers, toes and the top of the ears or nose. Symptoms include numbness, tingling and a change of color in the affected areas, which can become pale, blue or white. Even brief skin exposure in this Arctic blast can cause frostbite, officials say, so they recommend layering up on clothing and wearing mittens, scarfs, hats and warm shoes. Stock your car with blankets, food and water and extra batteries, in case you get stranded. In addition, they recommend avoiding prolonged outdoor activities, preparing for power outages and checking on elderly neighbors. Officials advise those who use crucial life-support devices to keep extra batteries on hand in case the power fails. And pets should not be left outside for extended periods of time. Warming shelters can be found by calling or texting 211. The Maine CDC has also issued information on heating assistance and other crucial services for dealing with the extreme weather. You can find that by clicking here.